Stainless steel Model 407 Bladder Pumps provide consistent, accurate, reliable groundwater samples in all applications. 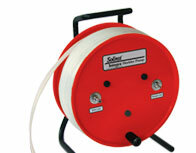 Ensuring no air/water contact during operation, pumps are ideal for VOC sampling. PTFE bladders are ideal for dedication. Inexpensive polyethylene bladders are also available. Stainless steel pumps are effective at any angle, to depths of 500 ft (150 m), and are ideal for low flow sampling. The Model 464 Pump Control Unit manually or automatically regulates the supply of compressed air to Pneumatic Pumps. Pre-set sample modes allow easy operation and up to 99 user-created flow rates can be saved to its memory. Learn how to get the best quality groundwater samples from a Double Valve Pump in our Technical Bulletin. Double Valve Pumps provide representative samples like a Bladder Pump, but without the use of a bladder. Ideal when sampling for PFAS.